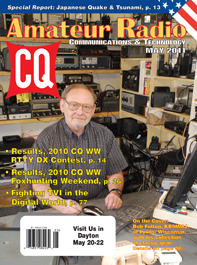 The May issue of CQ features a special report on ham radio's response to the March 11 earthquake in Japan as well as the subsequent tsunami that not only caused massive destruction in Japan but significant damage on the U.S. west coast as well. Next, we have the results of last year’s CW World Wide RTTY DX Contest – yet another record-breaking year as band conditions finally began to improve. More than 2600 logs were submitted and twelve new world records were set. World top scores include ST2AR, P49X, 5B/UT0O, S50A, ES9C, EF8M and CR3L. The Bavarian Contest Club took the club competition. The May issue also includes the results of last year’s CQ World Wide Foxhunting Weekend and the rules for this year’s running of the event, scheduled for May 14-15 (but clubs may choose any spring weekend for their entries). 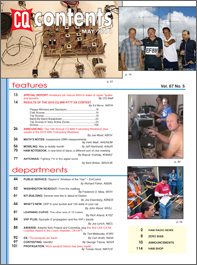 We've also got a profile of the 2011 Dayton Amateur of the Year, Shirley Roberts, N8LX, in our Public Service column; “Math’s Notes” columnist Irwin Math, WA2NDM, looks back at inexpensive SWT measurements; and "Washington Readout" editor Fred Maia, W5YI, answers questions from the mailbag. Mobiling Editor Jeff Reinhardt, AA6JR, has designated May as "Mobile Month," probably because it starts with an "M"; Kit-Building Editor Joe Eisenberg, K0NEB, previews several new kits set to debut at the Dayton Hamvention®; and New Products Editor John Wood, WV5J, looks at (among other things) a new pocket-sized QRP CW rig from MFJ and an updated version of the Yaesu FT-450D transceiver. 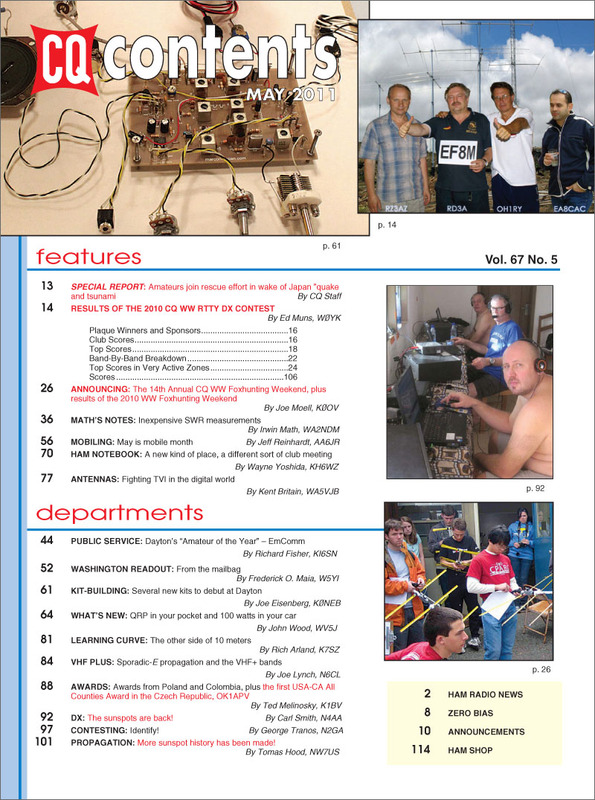 "Ham Notebook" columnist Wayne Yoshida, KH6WZ, visits what he terms "A New Kind of Place … A Different Sort of Club Meeting"; "Learning Curve" editor Rich Arland, K7SZ, looks beyond FM and repeaters to "The Other Side of 2 Meters," and Antennas Editor Kent Britain, WA5VJB, offers some weapons in the "old is new again" battle against TV interference in the new age of digital television. Awards Editor Ted Melinosky, K1BV, looks at new awards from Poland honoring the centennial of Madame Curie's Nobel Prize in chemistry; “VHF Plus” editor Joe Lynch, N6CL, looks at the phenomenon of sporadic-E propagation; DX Editor Carl Smith, N4AA, celebrates the return of the sunspots and previews upcoming DXpeditions, and Contesting Editor George Tranos, N2GA, summarizes his column topic this month with one word: "Identify!" Finally, Propagation Editor Tomas Hood, NW7US, covers the sudden and welcome rise of Cycle 24 after a year-long stall. That's a brief look at what's coming up in the May issue of CQ magazine, which should be on newsstands and in subscribers' mailboxes by late April. For information on becoming a CQ subscriber, click here!